TEN-MAN Hearts couldn’t hold on for a point at Tannadice as Paul Paton’s late effort from outside the box earned Dundee United a welcome three points. Jordan McGhee’s red card for two cautions late in the first half preceded Guy Demel’s first goal for Dundee United to break the deadlock. Jamie Walker produced a fine left-footed leveller shortly after the interval, but Paton’s drive two minutes from the end was fit to win any match. The result saw United answer chairman Stephen Thompson’s criticism in emphatic fashion. They had substitute Henri Anier dismissed late on but that couldn’t cloud a memorable afternoon for manager Mixu Paatelainen. For Hearts, it was a second successive loss following the midweek Scottish Cup defeat at Easter Road. After chairman Stephen Thompson’s scathing midweek statement, much interest surrounded the reaction of Dundee United’s players. They were branded “abysmal” for Tuesday night’s 3-0 home defeat by Motherwell and warned they had 13 games to save their season. Sitting 13 points adrift at the foot of the Premiership at kick-off, it was an arduous task to put it mildly but their response could only be admired. Hearts, having made five changes to the team which lost Tuesday’s Scottish Cup replay against Hibs, were on Tayside hoping to close the 11-point gap on second-placed Aberdeen. Being reduced to ten men before the interval seriously hindered their cause. They granted Canadian teenager Dario Zanatta his first senior start but were without Callum Paterson and Juanma Delgado due to niggling injuries. Neil Alexander was the first goalkeeper properly tested after 17 minutes. He performed a superb acrobatic save at his near post to claw out Edward Ofere’s header from Scott Fraser’s corner. Hearts were under a little pressure at that point, largely down to their own slack passes from defence going astray. Alexander saved his side again on the half-hour mark. He parried Guy Demel’s header from Blair Spittal’s right-sided cross and the ball was cleared. The keeper immediately screamed at Zanatta and Abiola Dauda for failing to track Spittal’s run, both players having fallen asleep when John Rankin’s pass from a free-kick sent Spittal clear. When Jamie Walker’s short backpass almost played Ofere in, Alexander emerged sharply to clear and again left outfield colleagues in no doubt about his unhappiness. Hearts were toiling to create clear chances but Gavin Gunning’s pass out of defence straight to Sam Nicholson helped greatly. Unfortunately for the winger, he strode forward and shot wide of target from 20 yards. The visitors were then reduced to ten men. McGhee was booked on 35 minutes for persistent fouling but clattered into Ofere four minutes later. Referee Kevin Clancy produced a second yellow card and a red, making McGhee the seventh Tynecastle player dismissed this season. That gave United even greater impetus. John Rankin skinned Blazej Augustyn to hit a post before Demel headed the opening goal. He again met Fraser’s corner and this time Alexander had no chance. It was a deserved interval lead for the home side. 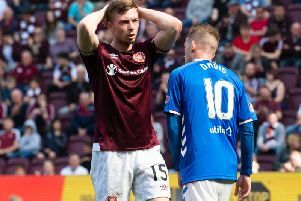 Hearts had replaced Zanatta with John Souttar seconds before the goal but the teenager’s every touch was jeered by Tannadice regulars. Hearts faced a difficult assignment with reduced numbers in the second half, however they managed the perfect start. The young United defender Coll Donaldson gave the ball away twice with some erratic defending and ultimately paid the price. His second concession landed with Souttar, who delivered a long ball forward in behind Donaldson. Walker fastened on to it instantly and blasted a finish with his left foot high beyond the United goalkeeper Eiji Kawashima. Demel and Florent Sinama-Pongolle were both taken off injured and United looked stunned for a spell. That said, substitute Ryan Dow should have restored their lead on 69 minutes. He sprinted on to Paul Paton’s loping ball forward and lofted it over the advancing Alexadner. The midfielder could only watch in frustration as his effort bounced in the six-yard box and went over the crossbar. Prince Buaben was next to depart through injury, with Arnaud Djoum taking his place in the Hearts midfield. Both teams were desperate not to lose this game and that led to many niggling jousts in midfield, plus some untidy play and regular fouling as the clock ticked on. Abiola Dauda was playing as a lone striker and had a decent opportunity to win the game for Hearts three minutes from time. Djoum’s pass sent the Nigerian through but he shot early entering the penalty box and gave Kawashima a straightforward save. It was a much-rued decision seconds later when United score the winning goal. Hearts scrambled a cross out of their penalty area to Paton almost 25 yards from goal. With admirable technique, the midfielder returned a vicious volley which flew past Alexander into the top corner of the net. The midfielder set off to celebrate as Tannadice erupted. Augustyn’s header in stoppage-time was blocked by Donaldson, but that was Hearts’ only real chance of a second equaliser. Anier appeared to kick out at Ozturk and was ordered off. By then, the points were safe for United. Dundee Utd (3-4-3): Kawashima; Donaldson, Gunning, Durnan; Spittal, Paton, Demel, Rankin; Fraser, Ofere, Sinama-Pongolle. Unused subs: Zwick, Dillon, Knoyle, Riski. Hearts (4-2-3-1): Alexander; McGhee, Ozturk, Augustyn, Oshaniwa; Buaben, Cowie; Nicholson, Walker, Zanatta; Dauda. Unused subs: Hamilton, L Smith, Pallardo, Reilly.